As the Pack 1967 Cubmaster, let me welcome you! Pack 1967 is chartered to the King's Park West Civic Association in Fairfax, VA, and we typically hold our Pack meetings on the second Wednesday of the month at Robinson High School cafeteria - feel free to join us, visitors are always welcome. Our pack strives to make every event as much fun as possible. Our pack meetings are interactive and sometimes entertaining; we have great events like launching rockets or racing model sailboats in a raingutter full of water; and we get out at least twice a year for Pack camping/hiking events. In addition to the fun, we try to make sure everybody in the pack follows the Cub Scout motto to "Do Your Best." In Pack 1967, all the parents help the boys do their best to learn skills that will help then through out the rest of their lives ... like how to tie a knot that will hold, what poison ivy looks like, and how to perform basic first aid. In addition to serving the boys, we serve the community. Pack 1967 Cub Scouts have assisted by collecting food for the less fortunate and helped to cleaning up local parks/school grounds. By parents working closely with the boys, these simple life lessons sink in and help the boys as they grow to adults. Pack 1967 has it all, we have fun, learn, and give back to the community - stop in for a visit, we would enjoy meeting you! Future Scouting Parents: This is your chance (”blue and golden opportunity”) to teach your son invaluable lessons, instill values that you think are really important, and most importantly, prove to your whole family that you know how to have FUN! Research has shown that early involvement in values-based programs is vital to strong character development. The longer a child stays in Scouting, the more likely they are to develop the values and skills needed to become an ethical and productive citizen. Register Anytime: Even though the Cub Scout programs kicks up into high gear in September (at the beginning of the school year), you can join at any time of the year! 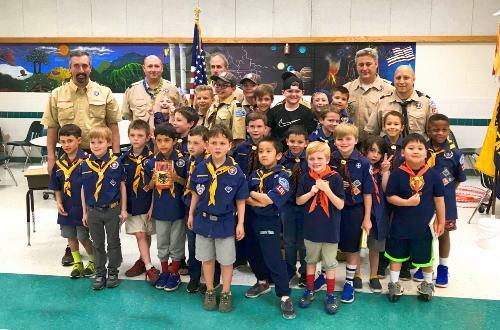 We welcome new members year-round, and if you just want to check out what Scouting (and what Pack 1967) is all about, you can always come to one of our pack meetings or events. Just contact our Cubmaster via email and see when we’re having the next meeting or event. 1) We recommend you come try us out first, visit with the Den Leader and meet the other Scouts. 2) When you are ready to join, fill out the online youth scout member application for Pack 1967.
i. Note: There is a prorated National BSA registration fee that will be charged when you process your application. (it may be ~$11). 3) After you register, our Cub Master will get and email and pass your information on to your Den Leader. BSA will process the form and email you a BSA membership #. 4) Your Den Leader will create an ScoutBook account for you and your scout. Once this membership # is associated with their ScoutBook account, the Den Leader and Parents will be able to track the scout’s progress on all their advancement and activities. The summer’s winding down, but Pack 1967 is still going strong! At the beginning of August, some of the Webelos Scouts attended the week-long camp at Goshen. The boys spent the week swimming in the lake, shooting bb guns, archery, learning ecology, scoutcraft, and handicraft. Later in the month, the Pack traveled to Arlington National Cemetery and laid a wreath at the Tomb of the Unknown Soldier. After that, the Scouts travelled in to Washington, DC, to complete the History of Scouting hike, a 2.5-mile hike through the city that honors the founders of the Boy Scouts of America while taking hikers through Scouting-related landmarks and sites. It was a long day, but the Scouts earned their hiking legs! Pack 1967 ended the summer with a cookout at Royal Lake. It was great to see everyone again as we get ready for the new school year! Pack meetings are typically the second Wednesday night of the month at 7:00 pm at LAUREL RIDGE ELEMENTARY SCHOOL's Cafeteria. Meetings last about an hour and a half (we're trying to keep it closer to the 1 hour mark), during which we celebrate each scouts’ achievements from the previous month, discuss a core theme/value, play games, and learn about our community. Per Fairfax County Public Schools, whenever schools are closed due to weather any extracirricular activities meeting in the school are also cancelled. We will try to provide timely updates via ScoutBook (a website for parents that provides calendar updates and tracks advancement requirements - available to all registered scout families), but check with your Den Leader if you still have questions. (18-Aug-18) Tomb of the Unknown Soldier Wreath Laying @ Arlington Cemetery & History Scavenger Hunt Hike in D.C. Interested Scouting Families...don't miss out! Contact us for details to join us for our next meeting or adventure! Pack 1967 Families, please use the Events Calendar in ScoutBook as the official (and more detailed) calendar for all pack and den events.